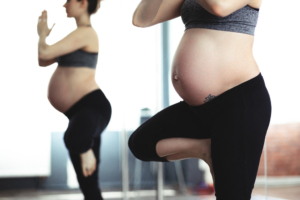 If you are pregnant and looking for safe ways to relax and stay fit, prenatal yoga can be a wonderful way to stay active and prepare your body for childbirth. Prenatal yoga is a multifaceted approach to exercise that encourages stretching, mental centring and focused breathing. Research suggests that prenatal yoga is safe and can have many benefits for pregnant women and their babies. Prenatal yoga can also help you meet and bond with other pregnant women and prepare for becoming a new parent. If you would like to feel confident, empowered and knowledgeable about labour and birth then these prenatal yoga classes are for you! During the term you will practise safe yoga postures which develop strength, stamina and flexibility and enable you to naturally adopt active birth positions in labour. You will learn simple and effective practices to reduce stress, strengthen your mind set and cope with pain including yogic breathing, mindfulness, movements to help labour progress, visualisations, sound, affirmations and relaxation techniques. The Birthing Tree classes are designed to be both strengthening and rejuvenating. Women are encouraged to follow their intuition, listen to their bodies and work at a level that’s appropriate for how they’re feeling that day. The classes address the use of yoga postures, meditation, breathing techniques and body awareness during the birthing process. The prenatal yoga classes are designed for women in the second and third trimesters of pregnancy (although women in the first trimester are most welcome to attend). The classes focus on exercising safely during pregnancy while also preparing your body and mind for the birth of your baby and beyond. The classes also provide an opportunity to meet and connect with other women. This course is dedicated to providing holistic support to pregnant women, through yoga practice, breath-work, and informative sessions on birth preparation and lateral services, such as doula support and courses that are good to know such as calm birth, and preparing for your first six weeks with bub. Mums and Bubs Yoga classes are for mums with their babies who are between 6 weeks and up to crawling. The classes incorporate gentle yet strengthening yoga for you, songs and yoga for your baby, simple mindfulness and relaxation practices to use at any time and a great chance to share the highs and lows of mothering with like-minded women. Yoga Mums Fitness specialises in Prenatal (Pregnancy) Yoga and Postnatal (Mums & Bubs) Yoga . The classes are intended to guide you through a yoga journey before your baby is born, and then afterwards to help you get back into shape. Yoga for the active pregnancy. Providing an energetic and physical yoga class for women who wish to maintain their fitness throughout pregnancy. Women will build strength to assist in an active labour and also learn skills/tools to help respond to the challenges that may be presented.